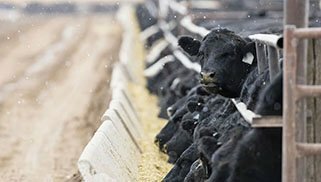 Davenport Evans litigation lawyer Mitch Peterson appeared on KELO NewsTalk Radio 1320 AM/107.9 FM May 16 and June 12 to discuss Concentrated Animal Feeding Operations, CAFOs, in South Dakota. The interviews were part of an on-going news segment called It’s Your Business, with Bill Zortman, which features local business people discussing topics of interest relating to agriculture, medicine, and general business. A Concentrated Animal Feeding Operation (CAFO) is typically defined as a lot, yard, corral, building or other area where animals have been, are, or will be stabled or confined for a total of 45-90 days or more during any 12-month period, and where crops, vegetation, forage growth, or post-harvest residues are not sustained over any portion of the lot or facility. The class of a CAFO depends on the number of animal units (AUs) involved, with the largest class typically having 2,000 to 5,000 AUs. Each species of animal has a different factor for determining the number of corresponding AUs (for example, 1 feeder cattle is 1 AU, 1 nursery swine under 55 pounds is .1 AU). Common examples of CAFOs include: dairies, swine operations, and feed lots. In part two of Mitch Peterson’s KELO NewsTalk, he and Bill Zortman discussed Land Use in Farm Country. In addition to CAFOs in South Dakota, Peterson outlined concerns relating to Right to Farm covenants, drainage rights, and wind energy. Click to play the podcast above to hear more. Davenport Evans lawyers have been key in some of the region’s most complex and notable land use litigation concerning concentrated animal feeding operations and feed lots, dairy operations, drainage rights, wind farms, wind turbines and wind energy. Davenport Evans attorneys are also regularly engaged by clients in zoning and land use litigation, conditional use permits, county level hearings and court appeals, variance requests, and city zoning issues. To learn about other areas of Davenport Evans litigation, visit our Practice Areas page and click on Litigation. Contact our Zoning and Land Use attorneys for more information: Mitchell A. Peterson, Justin T. Clarke and Reece M. Almond.